Turkey: The Nigerian duo of Mikel Agu and William Troost-Ekong started for Bursaspor in a 1-home win over visiting Robinho’s Sivasspor in a Turkish Super Lig match on Saturday at the Bursa Buyuksehir Belediye Stadium. Super Eagles defender Abdullahi Shehu, was not listed in the match day squad for Bursaspor. 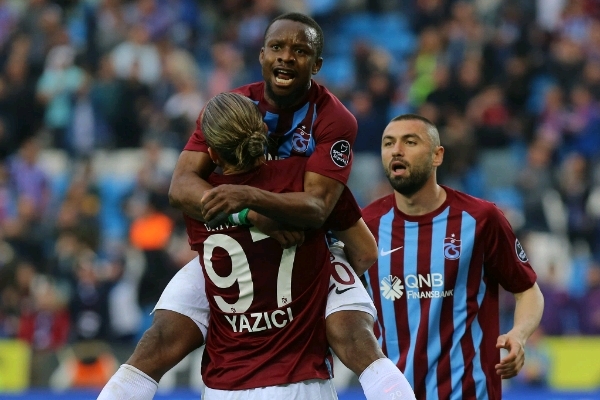 Super Eagles midfielder assistant Captain Ogenyi Onazi was on target for Trabzonspor who thrashed Azubuike Okechukwu’s Yeni Malatyaspor 4-1 in a Turkish Super Lig match on Sunday. Onazi scored the fourth goal for Trabzonspor in the 86th minute and was booked in the 61st minute. Azubuike Okechukwu started for Yeni Malatyaspor and played all 90 minutes. England: Chelsea put behind their UEFA Champions League dissappointment as they defeacted Leicester City 2-1 after extra-time at the King Power Stadium to qualify for the semi-finals of the Emirates FA Cup on Sunday. The Super Eagles of Nigeria trio of Kelechi Iheanacho, Wilfred Ndidi and Victor Moses started for Leceister City and Chelsea respectively. Kelechi Iheanacho was later replaced by Shinji Okazaki in the 68th minute. Victor Moses was booked in the 89th minute for what looked like an elbow to the face of Leicester City’s Marc Albrighton, while Wilfred Ndidi shone like a million stars in the colours of Leicester City but his show stopping performance was not enough to give Leicester City the much needed victory over Chelsea who now play Southampton in the semi final. Chelsea loanee Ola Aina made his 36th English Championship appearance for Hull City in Saturday’s 3-0 defeat away to Birmingham, while Sone Aluko started for Reading and was in action for 52 minutes in his 28th league appearance as they lost 3-2 away to Norwich. Germany: Nigeria first choice centre-back Leon Balogun returned to the starting line up of Mainz 05 on Saturday as they lost 3-0 away to high flying Eintracht Frankfurt. The other Nigerian at the club Anthony Ujah made his first Bundesliga start and fourth appearance so far this season since his return to Mainz 05 in January from the Chinese League and was on for 55 minutes before he was replaced by Yuyo Muto. Else where in the Bundesliga Nigerian youth international Victor Osimhen made his 10th league appearance for Wolfsburg this season, coming off the bench as substitute to replace Riechedly Bazoer in the 80th minute in Saturday’s 1-0 home defeat to Schalke 04. Italy: Super Eagles midfielder Joel Obi was an unused substitute for Torino in Sunday’s 2-1 Serie A defeat to home side Fiorentina at the Stadio Olimpico. The defeat was Torino’s fourth straight loss in the Serie A and this has further reduced their chances of UEFA Europa League qualification. Spain: Super Eagles midfielder Oghenekaro Etebo failed a late fitness test and missed Las Palmas’ 1-1 La Liga draw away to relegation threatened Deportivo La Coruna, the other Nigerians on the books of Las Palmas Imoh Ezekiel was an unused substitute while Emmanuel Emenike was not listed in the match day squad. Nigerian forward Isaac Success started for relegation bound Malaga who held Celta Vigo to a surprise 0-0 away draw in the Spanish La Liga game on Sunday. Isaac Success was replaced in the 69th minute by Keko, fellow Nigerian in the Malaga team Brown Ideye was not listed for the match. China: Nigerian Super Eagles striker Odion Ighalo scored his first goal of the new Chinese Super League (CSL) season as his club Changchun Yatai were held to a 1-1 home draw by Beijing Renhe on Sunday. Super Eagles Captain John Obi Mikel started for Tianjin Teda at home to Tianjin Quanjian in the Chinese Super League (CSL) match on Sunday. Mikel Obi grabbed two assists for hat-trick hero Frank Acheampong in the 16th and 84th minute respectively for Tianjin Teda’s first and second goals. Frank Acheampong however grabbed his hat trick and Tianjin Teda’s third goal in stoppage time to give John Obi Mikel and fellow team mates their first win of the new Chinese League. Mikel Obi was in superb form in the midfield of Tianjin Teda and was booked in the 39th minute. Kazakhstan: Former Sunshine Stars striker Tunde Adeniji started for Atyrau but was sent off in the 33rd minute for two bookable tackles in a Kazakhstan Premier League game away to Kairat Almaty. Atyrau lost the match 2-0 through goals by Hugo Silveira in the 56th minute and Yan Vorogovsky in the 86th minute.